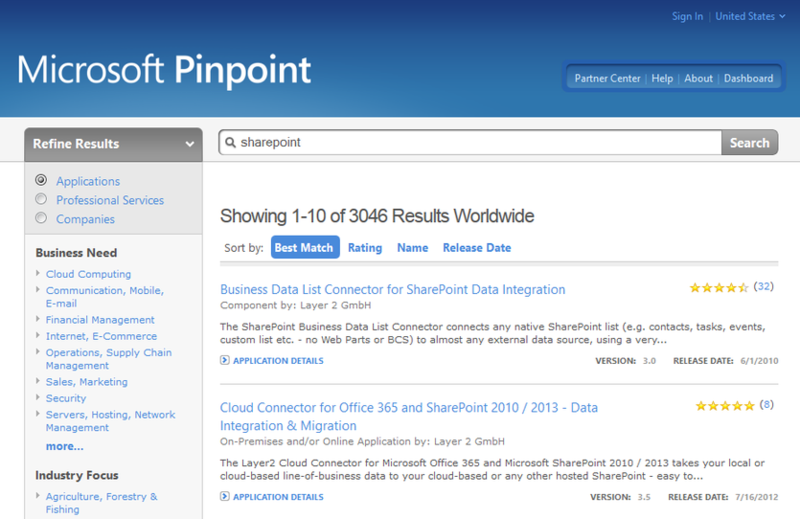 Do you know the highest ranked SharePoint Apps at the Microsoft Pinpoint marketplace? What is Microsoft Pinpoint? Pinpoint helps business customers find technology experts, software applications, and professional services that solve specific business issues and support long-term goals. At the same time, Pinpoint helps developers and technology service providers get applications and professional services to the customers who need them. Because I'm especially interested in SharePoint, I will take a look at this area. What are highest ranked SharePoint Apps at Microsoft Pinpoint? Think as a SharePoint expert you definitely should know. It seems to be that migration and external data integration is a very often requested feature. Both top leading apps are closing some gaps around this issue. While the Business Data List Connector can manage SharePoint on-premise data integration, the Cloud Connector is focussed to Microsoft SharePoint Online integration as part of Microsoft Office 365. You will find more top ranked SharePoint apps here. Don't miss the shared customer reviews for pros and cons.